The leader of the Boko Haram sect , Abubakar Shekau, is on the run but in disguise to avoid being arrested by troops in counter-terrorism operations in northeast Nigeria. The late Governor of Bayelsa State, Diepreye Alamieyeseigha, may have inspired someone in far away Sambisa forest. His escape from a foreign country back to Nigeria in a female attire is still fresh in the mind and the leader of Boko Haram terrorists, Abubakar Shekau, has adopted this style, as he tries to escape from the onslaught of troops in counter-terrorism operations in northeast Nigeria. A military statement on Tuesday said the leader of the dreaded group that has terrorised communities in the northeast for more than eight years is now on the run. But the funny thing is that you may not know Shekau when you see him and the military wants you to be on the lookout for a man in Hijab. The military, however, gave the colour of the female attire he had on while making his escape just in case you find the fugitive leader of Boko Haram. A statement by the spokesman for the Nigerian Army, Brigadier General Sani Usman, said the leader of the sect abandoned his members and fled in the heat of the operation and is running for his dear life. "Consequently, Boko Haram terrorists are in disarray and scampering for safety while others were surrendering. "The concerted efforts of troops of Operation LAFIYA DOLE on the ongoing clearance of the Boko Haram terrorists through Operation DEEP PUNCH II has been yielding tremendous results. "Troops have successfully been clearing Boko Haram camps in Sambisa forest including Camp Zairo," the statement read. In the course of the heightened operations in the past few days, troops have also rescued civilians being held hostages by the terrorists, recovered arms, ammunition, Improvised Explosives Devices (IED) factories and making materials as well as other equipment. "Credible information from arrested and surrendered insurgents indicated that the purported Boko Haram terrorists group factional leader, Abubakar Shekau could not bear the heat anymore as he has abandoned his followers, he is running for his dear life. "He is desperately trying to escape the theatre disguised as a woman dressed in Hijab. "We reliably gathered that to avoid detection Abubakar Shekau alternates between blue and black coloured hijabs. He was last seen in a black hijab. "We therefore call on all those remaining Boko Haram terrorists to know that they are following a coward moving about in hijab disguised as a woman. "We also request all the remaining Boko Haram members to come out from hiding and lay down their arms and be treated humanely," the Army further stated. 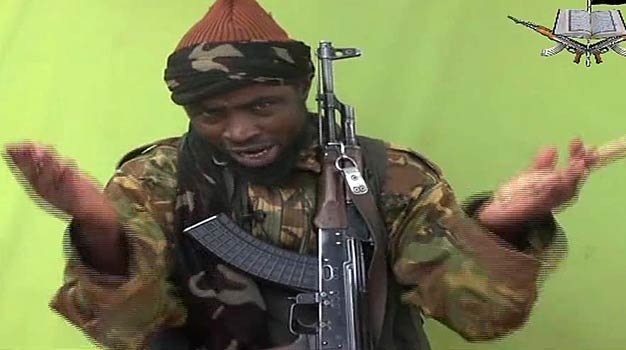 The spokesman said that while concerted efforts were ongoing to track and apprehend the fugitive terrorist leader, "we implore also members of the public, especially the residents of Adamawa, Borno and Yobe States, to be more vigilant, security conscious and be on the lookout of Abubakar Shekau and other terrorists that might disguise as women to escape". The next time you see a man with beards looking funny, please check very well.